Explain why nations and companies participate in international trade and how trade between nations is measured. The globalization of business is bound to affect you. Not only will you buy products manufactured overseas, but it’s highly likely that you’ll meet and work with individuals from various countries and cultures as customers, suppliers, colleagues, employees, or employers. The bottom line is that the globalization of world commerce has an impact on all of us. Therefore, it makes sense to learn more about how globalization works. 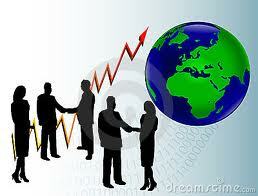 Never before has business spanned the globe the way it does today. But why is international business important? Why do companies and nations engage in international trade? What strategies do they employ in the global marketplace? What challenges do companies face when they do business overseas? How do governments and international agencies promote and regulate international trade? Is the globalization of business a good thing? What career opportunities are there for you in global business? How should you prepare yourself to take advantage of them? These are the questions that we’ll be addressing in this chapter. Let’s start by looking at the more specific reasons why companies and nations engage in international trade. Why does the United States import automobiles, steel, digital phones, and apparel from other countries? Why don’t we just make them ourselves? Why do other countries buy wheat, chemicals, machinery, and consulting services from us? Because no national economy produces all the goods and services that its people need. Countries are importers when they buy goods and services from other countries; when they sell products to other nations, they’re exporters. (We’ll discuss importing and exporting in greater detail later in the chapter.) The monetary value of international trade is enormous. In 2007, the total value of worldwide trade in merchandise and commercial services was $16.8 trillion. To understand why certain countries import or export certain products, you need to realize that every country (or region) can’t produce the same products. The cost of labor, the availability of natural resources, and the level of know-how vary greatly around the world. Most economists use the concepts of absolute advantage and comparative advantage to explain why countries import some products and export others. A nation has an absolute advantage if (1) it’s the only source of a particular product or (2) it can make more of a product using the same amount of or fewer resources than other countries. Because of climate and soil conditions, for example, Brazil has an absolute advantage in coffee beans and France has an absolute advantage in wine production. Unless, however, an absolute advantage is based on some limited natural resource, it seldom lasts. That’s why there are few examples of absolute advantage in the world today. Even France’s dominance of worldwide wine production, for example, is being challenged by growing wine industries in Italy, Spain, and the United States. How can we predict, for any given country, which products will be made and sold at home, which will be imported, and which will be exported? This question can be answered by looking at the concept of comparative advantage, which exists when a country can produce a product at a lower opportunity cost compared to another nation. But what’s an opportunity cost? Opportunity costs are the products that a country must decline to make in order to produce something else. When a country decides to specialize in a particular product, it must sacrifice the production of another product. • High Tech makes, for example, three more boats but gives up the opportunity to make the nine telescopes; thus the opportunity cost of making each boat is three telescopes (9 ÷ 3 = 3). • Low Tech makes, for example, two more boats but gives up the opportunity to make one telescope; thus the opportunity cost of making each boat is half a telescope (1 ÷ 2 = 1/2). • Low Tech, therefore, enjoys a lower opportunity cost: Because it must give up less to make the extra boats, it has a comparative advantage for boats. And because it’s better—that is, more efficient—at making boats than at making telescopes, it should specialize in boat making. • High Tech makes, for example, nine more telescopes but gives up the opportunity to make three boats; thus, the opportunity cost of making each telescope is one third of a boat (3 ÷ 9 = 1/3). • Low Tech makes, for example, one more telescope but gives up the opportunity to make two boats; thus, the opportunity cost of making each telescope is two boats (2 ÷ 1 = 2). • In this case, High Tech has the lower opportunity cost: Because it had to give up less to make the extra telescopes, it enjoys a comparative advantage for telescopes. And because it’s better—more efficient—at making telescopes than at making boats, it should specialize in telescope making. Each country will specialize in making the good for which it has a comparative advantage—that is, the good that it can make most efficiently, relative to the other country. High Tech will devote its resources to telescopes (which it’s good at making), and Low Tech will put its resources into boat making (which it does well). High Tech will export its excess telescopes to Low Tech, which will pay for the telescopes with the money it earns by selling its excess boats to High Tech. Both countries will be better off. Things are a lot more complex in the real world, but, generally speaking, nations trade to exploit their advantages. They benefit from specialization, focusing on what they do best, and trading the output to other countries for what they do best. The United States, for instance, is increasingly an exporter of knowledge-based products, such as software, movies, music, and professional services (management consulting, financial services, and so forth). America’s colleges and universities, therefore, are a source of comparative advantage, and students from all over the world come to the United States for the world’s best higher-education system. France and Italy are centers for fashion and luxury goods and are leading exporters of wine, perfume, and designer clothing. Japan’s engineering expertise has given it an edge in such fields as automobiles and consumer electronics. And with large numbers of highly skilled graduates in technology, India has become the world’s leader in low-cost, computer-software engineering.